As the season changes it’s a great time to stop and assess where your wardrobe is at across your professional and casual attire. Evaluate what you’ve actually worn in the past 6 months and if it’s not a key seasonal piece and you haven't worn it in yonks it's maybe time to let it go. Sell it, trade it, or give it to a charity as you’ll need the room with some of these affordable new season pieces from Farmers. In collaboration with my good friends at Farmers I’m back in-store checking out what I’m loving about their Spring offering and to do what I do best, throwing on a few favs to help demonstrate how you too can spruce yourself up for work and life outside of it this Spring. Gasoline is one of the staple on-trend men's labels at Farmers and for this edit, I've sought inspiration from this label to pull together three key looks to give you a feel for how you can work up a variety of smart to casual outfits ready to take on anything and not have to pay the world for it. If ever in doubt about the dress code, going smart is the way to go. No one is ever going to knock a bloke that looks sharper than the rest. For this ensemble, I'm wearing a pair of my favourite light blue denim jeans (which you can find similar here from Farmers) and as you've probably noticed recently I picked up this Calvin Klein pink pastel dress shirt to well 'dress it up'. Denim jeans and a dress shirt - yes of course - not that original right? But I'm not done yet. While cruising around the men's department I spotted this awesome Gasoline cotton two-button blazer. I can't get enough of blazers (my wardrobe proves it) and loved that this one didn't subscribe to the typical rigid structure of a jacket, as it was soft in texture and feel and had big pockets as a design feature. Throwing this as the outerwear layer it pulled the whole look together. You end up looking sharp but without the need for going full James Bond on it. 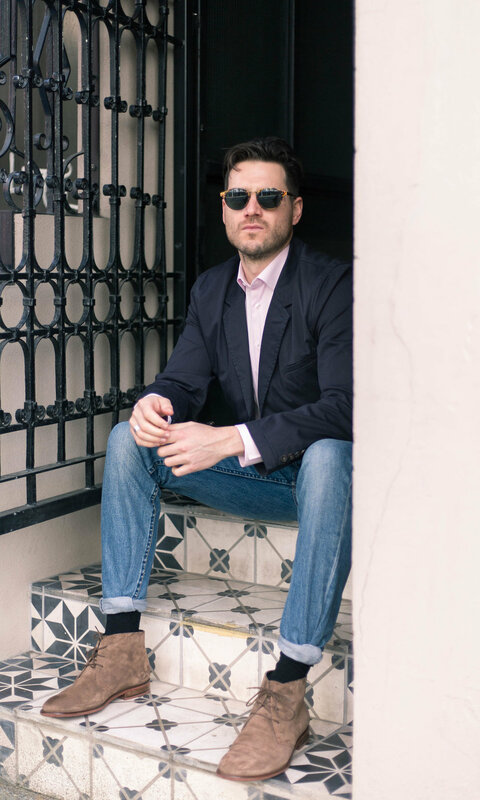 A good nice denim wash for the jeans, some colour in the dress shirt and a blazer to give the outfit some construct and hint of suaveness is a great option for looking smart for that meeting, after work drinks or tinder date. I've never had the opportunity to wear a dark denim shirt like this before. I've always wanted to grab one, but wasn't entirely convinced I'd suit it so never picked one up. But in my constant quest to try new things, I gave it a go this time and think it really works quite well. This blue denim short sleeve works in swimmingly with a chino pant and I've gone for the Gasoline khaki green chino which is a big colour you'll be seeing everywhere this season you may have noticed. 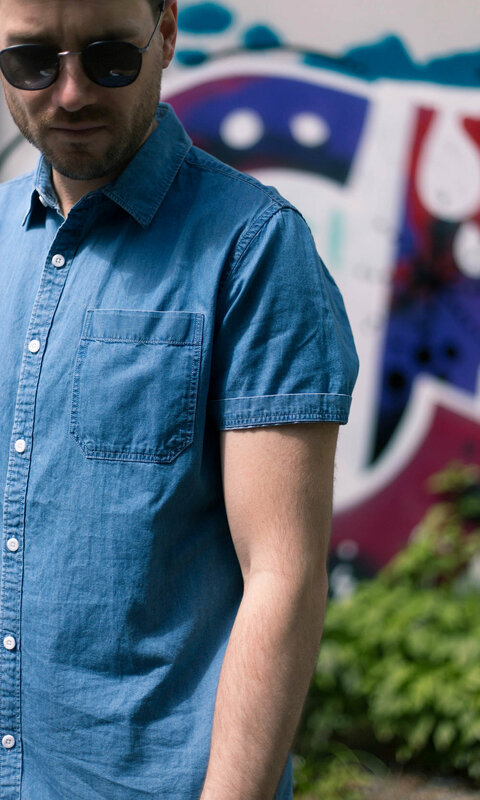 The dark tone of the denim makes for a really smart shirt, and not all short sleeves can say that. Because we're talking smart casual, I also threw on the excellent find that was the cotton two-button blazer to get even more bang for buck and it's very apparent no matter if it's a collared shirt, a short sleeve or a tee underneath this blazer is working its magic so it's a super good investment in my eyes. Down to the sneakers, you may recognise these bad boys. They're Common Project leather sneakers that at the moment only come out on special occasions as they're so clean & tidy and I'm trying to keep them that way! Roll out the short sleeves. As the weather is heating up it's a great idea to grab a few short sleeve shirts to sport those newly minted guns you've been shaping at the gym. I get the sense that short sleeves are making a bit of a comeback this season after some time of being not welcome in popular fashion. I'm an avid fan of short sleeves when you get the right pattern or design and with this Hula-Palm print from Gasoline, who wouldn't want to be looking tropical? I've gone with wearing some tailored chino pants, another goodie for the warmer seasons, but you could just as easily switch out pants for chino shorts too, but my legs were so white they were reflecting sunlight. Need some serious beach action asap. Tuck in or tuck out the shirt, see how it looks and feels and you've got yourself a season-appropriate fresh look like a pineapple Malibu cocktail. And in those cases where it cools down in the evening or the guns are getting too much heat from the ladies, throw on this bomber from Gasoline. From smart to casual there are so many ways to slide up or down the style scale. Hopefully, I've demonstrated that through a few key items you can get quite a bit of mileage out of them whatever the occasion. Always more than happy to provide personal recommendations and styling advice so just reach out and get in touch in the comments below or hit me up via email jaheb@jahebbarnett.com and we can Spruce you up for Spring. Get out there and enjoy the extra hours of sunshine. Massive thank you to my all round insanely creative friend & photographer Tori Hayley for always doing an amazing job with capturing the looks and moments.